Longtime Oklahoma City residents remember TG&Y staying open through the 1980s, with a brief revival in the 1990s. But in reality, the Oklahoma City-based retailer's death began in January, 1970 with the retirement of Raymond Young. It was Young, more than anyone else, who was the heart and soul of the chain. In his biography, "The Making of a Merchant," Young detailed his rise as a farm boy who went for a business administration degree at OSU. From there he rose up through the ranks of Kessege stores (the early-day version of Kmart) and then started his own small chain of five-and-dime stores. 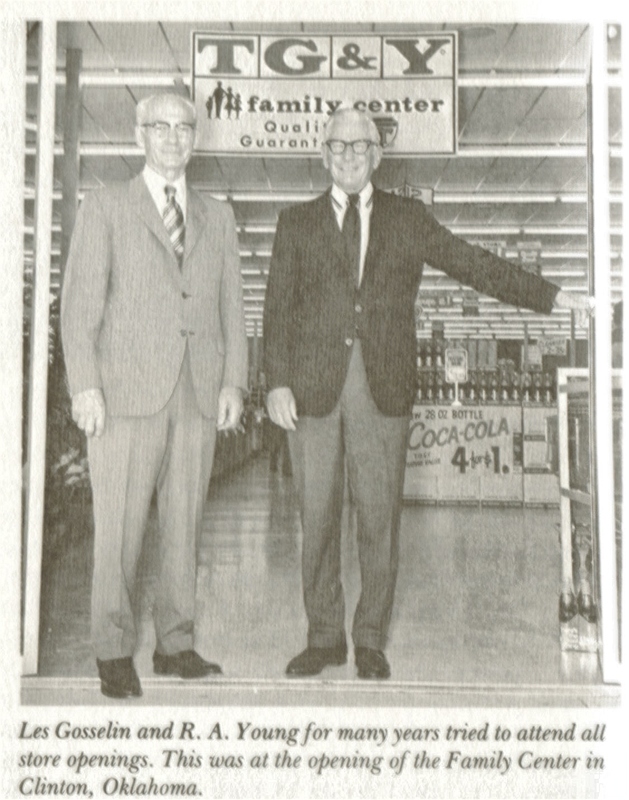 TG&Y was started when Young merged his stores in 1935 with those of Rawdon E. Tomlinson and Enoch L. "Les" Gosselin. Ultimately, Tomlinson ducked out of the deal early on, and Gosselin was in and out of the business for the first decade or so. But Young stayed firmly in charge, even after the company was sold to out-of-state corporate owners. Reading Young's biography, it becomes clear that firm grip may have been what ultimately doomed TG&Y. In one chapter Young discussed how he dealt with employee theft; he fired the "smartest girl" working in the store. No proof was needed - Young simply believed odds were high it was the "smart girl" who was best suited for such a crime. Young sold the chain in 1957 to corporate interests with the understanding he would remain in charge and be allowed to run the chain as he had for the previous 30 years. It was during this time that TG&Y grew to be a nationwide chain - one that was far bigger than Wal-Mart. At its peak the chain boasted 925 stores in 29 states stretching from California to Florida. In the 1960s the chain began to roll out family centers that offered a wider selection of merchandise than the traditional five-and-dime. The concept was a success and it wasn't too long before developers were competing to place a TG&Y store along with an adjoining C.R. Anthony's and IGA as anchors of their suburban strip shopping centers. At one point C.A. "Pat" Henderson, a top executive with the chain, came to Young with a visionary idea; combine the concept of a discount store with one that sold groceries. But Young couldn't go for it (we now know that Sam Walton and his troops did and with great success). When Young retired in 1970, the top spot at TG&Y became a game of musical chairs and slowly but surely, Oklahoma City's corporate headquarters began to lose control of the stores to out-of-state corporate offices. I'm not sure which move was the certain harbinger of death for TG&Y - its miserable attempt in the early 1980s to convert successful TG&Y Family Centers to Aim for the Best department stores, or the take-over by McCrory Stores in 1986. The Aim for the Best experiment was costly for the chain, and it was abandoned after a year or so with a change in top leadership. A controversial firing and interrogation of employees suspected of kickbacks and theft led to more bad headlines. In 1982 the chain, long a moneymaker, lost $16 million. The McCrory's takeover was certainly devastating to TG&Y's Oklahoma City operations. The chain had about 720 stores at the time. McCrory cut more than 8,000 employees, closed 205 stores, including 23 of the TG&Ys in Oklahoma. And then it attempted to wipe out the TG&Y name altogether, replacing it with McCrory. 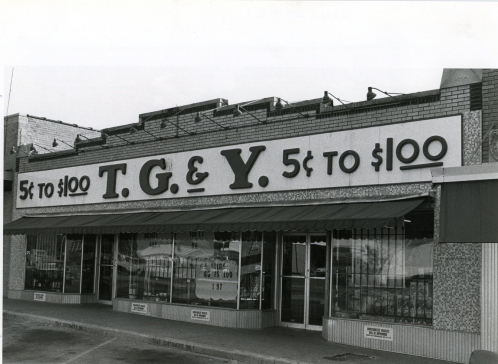 By the time TG&Y officially died in 2001, it had already been long forgotten and most Oklahoma City residents might have been surprised to learn a few token stores with the TG&Y name still existed. - "TG&Y's Latest Exec Team Finalizing New Turnaround Plan," The Oklahoman, by Kevin Leval, Jan. 9, 1986.